You’ve got to love this design. It’s compact, it’s sturdy, and it’s ingenious! It takes up less space while drying more wet things. It eliminates the clutter of clothing and towels haphazardly strewn around on tables, tree branches, tent platforms, or overcrowded on a disorganized array of drooping clothes lines. It can be set up in a location where there is the most sunshine. It’s especially useful when camping in an open area with few trees. Lash the triangles. 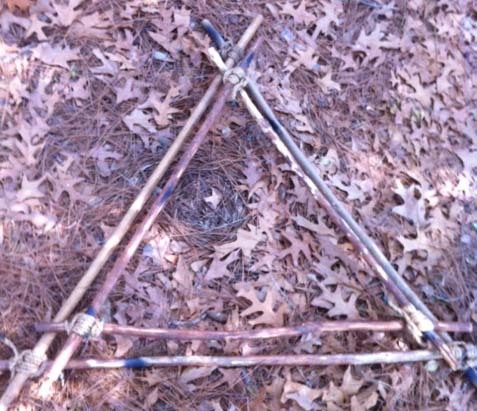 Start by lashing together two equilateral triangles, one smaller for the top (three 4-foot sticks), and the larger one for the bottom (three 5-foot staves). Use square lashings. 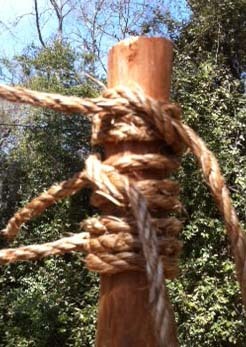 One easy way is to lash two at 90° and then bend them in and tie the third square lashing to make the triangle. 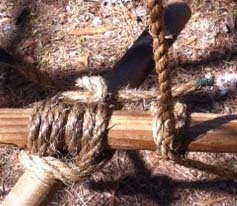 This yields a nice, tightly-lashed triangle, (but be careful you’re not putting too much stress on the ropes and poles when preparing to apply the third lashing). Erect the upright. Pound in a pioneering stake and lash the 6-foot pole to it securely with two tight strop lashings or round lashings. Making this upright stand up vertically without moving or wobbling at all is a key to a good and sturdy clothing dryer. So, solidly pound in the stake and make sure it’s as straight as possible. Also, make sure the lashings are well-tied and tight. 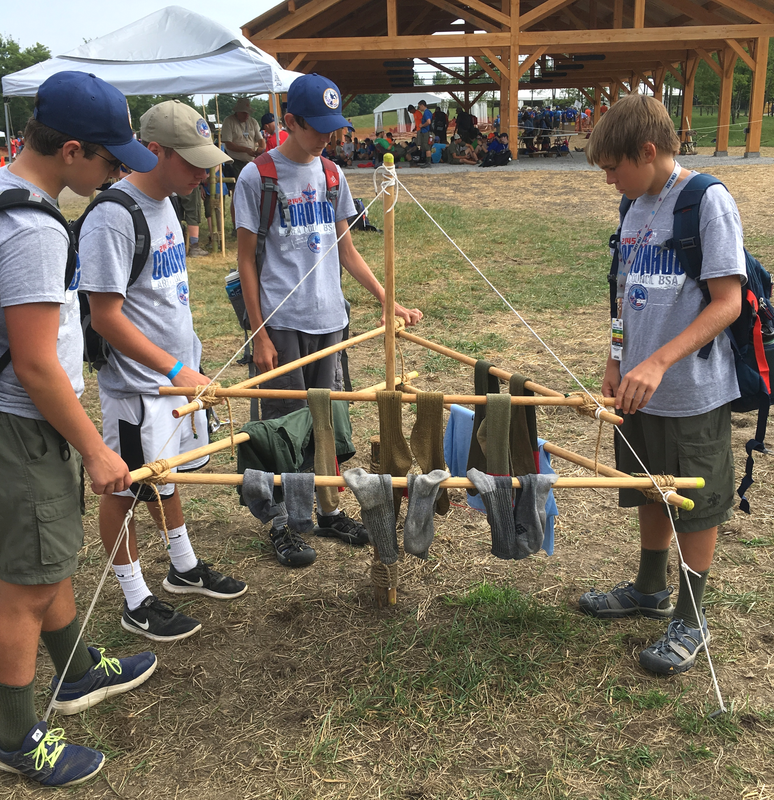 —> ALTERNATIVE APPROACH: A clothes drying rack can be erected without having to either pound in a stake or sink the center pole, by using the same principle as when erecting a flagpole. The key is using the support ropes as guylines. SEE PHOTO. Attach the triangles. Lay the triangles on the ground over the upright, first the larger triangle, and then the smaller one on top. 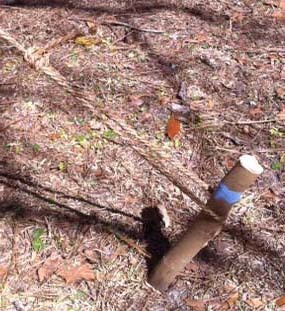 Tie each corner of the smaller triangle to a support rope so it will be suspended about 5 feet above the ground. Use clove hitches which can be adjusted as necessary to assure the triangle hangs evenly and the 4-foot sticks are horizontal. Continuing with each of the three support ropes, repeat this process for the larger triangle so that it will hang about 4 feet above the ground. 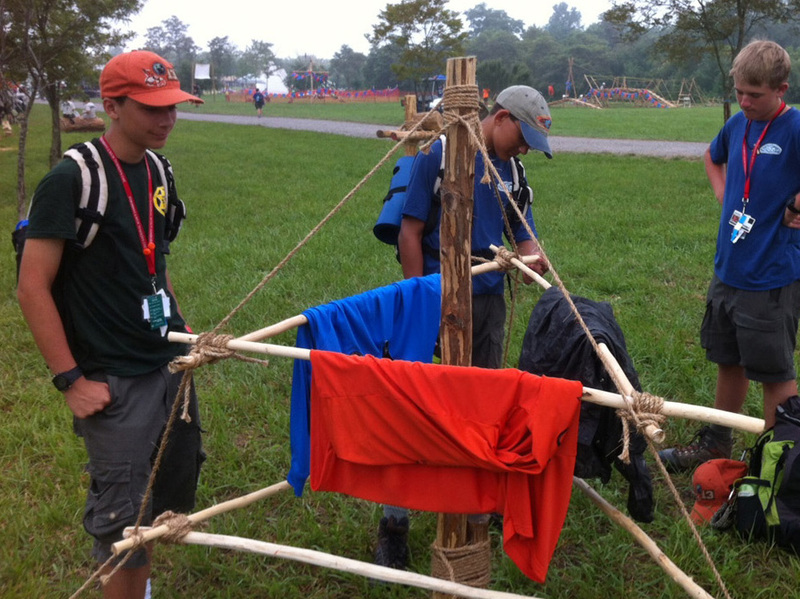 An assembled clothes drying rack at the 2013 Jamboree gets the once over.